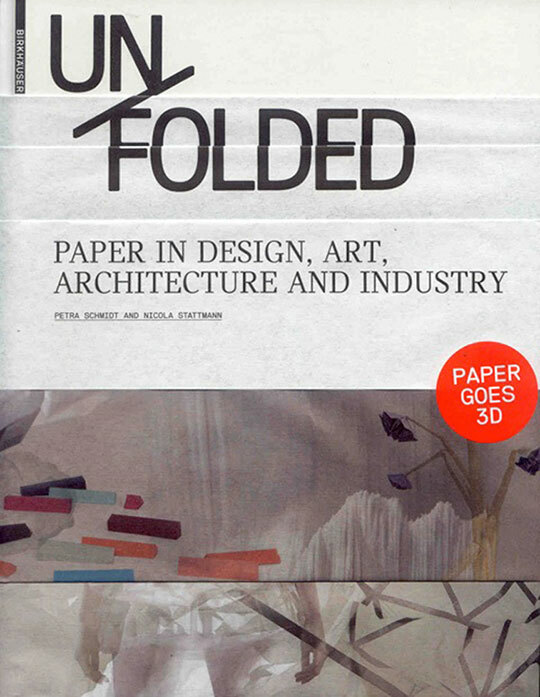 ‘Unfolded – Paper in Design, Art, Architecture and Industry’ presents paper as a valuable ecological and contemporary material. With its enormous selection of projects, lavish design, and numerous illustrations, Unfolded provides designers with inspirations for their work. From a content perspective, it is a comprehensive list of technical papers and innovative paper technologies intended to support designers in their everyday work with technical information on the ‘high-tech’ material paper. The Unfolded book includes a double page spread on Atopos cvc’ research on the use of paper in contemporary fashion practices and presents the exhibition ‘RRRIPP!! Paper Fashion’. Other participating artists and designers in the book are: Miyake Design Studio, Maison Martin Margiela, Hussein Chalayan, Kostas Murkudis (also participants in the RRRIPP!! Paper Fashion exhibition at the Benaki Museum). On the occasion of the launch of Unfolded, an exhibition with a selection of the materials and projects described in the book took place at Gewerbemuseum Winterthur in Switzerland (5 Jul – 16 Aug 2009), curated by Nicole Lehner and Luzia Kälin. Atopos cvc took part in the exhibition with a selection of 60s paper dresses from the Atopos Paper Dress Collection that demonstrate the usability of paper as an inventive, revolutionary, design material.